This multiple-award winning film tells a touching father-son canoeing story. Rapid Media headman Scott MacGregor takes his 4-year old son down Algonquin’s Petawawa river in frosty October. This multiple-award winning film tells a touching father-son canoeing story. 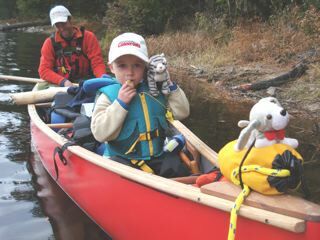 Rapid Media headman Scott MacGregor takes his 4-year old son down Algonquin’s Petawawa river in October. The frosty mornings contrast with the touching warmth of their relationship on this classic whitewater river. Dougie runs challenging rapids, climbs up the Natch cliffs, fishes for muskie & toasts marshmallows in this endearing feel-good film. Winner of best professional documentary at the National Paddling Film Festival in America and finalist in the Kendal Mountain Film festival. 650 MB. 17 minutes. Shot in HD. 16 x 9 widescreen.